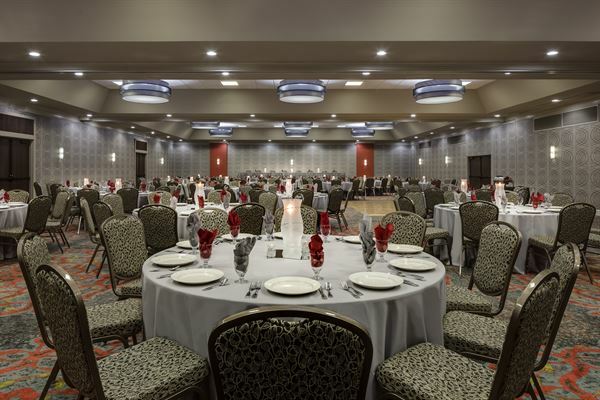 The award-winning Holiday Inn Wichita East I-35 is a beautiful 9 story high rise hotel featuring an Indoor Pool, Whirlpool, Fitness Center and our all new Blue Cedars Terrace outdoor event venue. The hotel is conveniently located at the corner of Rock & Kellogg (US 54/400) next to Towne East Square shopping mall and within minutes to area attractions. In addition, there are also has numerous casual dining restaurants, including the Green Mill Restaurant & Bar. With over 11,000 square feet of modern, flexible meeting space the Holiday Inn Wichita East I-35 can handle groups for 5 to 800. Call our Sales & Catering Department for more information or to book your event today!